We all want to eat healthier, but organic food is a lot more expensive than their counterparts. Do you really need to eat all organic foods? 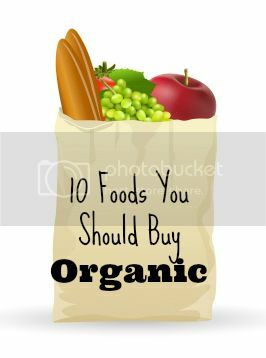 It's probably better to switch to all organic foods, but if you are on a budget--like most families--here are 10 foods that you should buy organic. If you haven't priced organic foods lately, you might be surprised. Prices are dropping, and some stores have generic or private label organic foods. Wal-Mart is carrying some Great Value organic foods, and Aldi has many available. Personally, I shop at Aldi for their organic, and everything has been wonderful so far! In order to be labeled as organic, the animal can't be given any growth hormones or antibiotics. The animals must also be fed only grains that were grown without using pesticides or fertilizers. More importantly, the animal can't be fed any byproducts from other animals. Organic meat is expensive, but it is worth it. The taste is better, and beef often has a lot less fat. I buy mine from a local store that sells beef raised in my home county. You might find a farmer who sells meat by the animal or half an animal. You'll put out a lot of money upfront, but it is cheaper per pound. Milk can contain pesticides from the farmer, and the cow can eat grains grown with chemicals and pesticides. Artificial growth hormones can also be passed along through the milk. With organic milk, the cow isn't given antibiotics and eats only organic grains. Both Aldi and Giant Eagle sell milk from cows that aren't given antibiotics or growth hormones. Giant Eagle stopped advertising this a few years ago, but I did contact them and it is still from antibiotic and hormone free cows. The milk isn't organic, but it is an affordable option for families. Strawberries are very healthy for you, but their large surface area soaks up chemicals and pesticides. They are also hard to wash because of the bumps on the skin. Since you eat the skin, you'll eat all the chemicals that the strawberry has absorbed. When the hen eats food with pesticides or is exposed to chemicals, she can pass the chemicals to her eggs. Organic eggs are from chickens fed only organic feed and who aren't subjected to antibiotics or growth hormones. Look for organic eggs in your grocery store, or better yet, look for a farmer. We have a flock of 50 or so chickens, and we sell eggs from our home. The eggs do taste better, and they have a beautiful big orange yolk that you won't find in the store. I'll admit it: I do miss microwave popcorn! The bags contain a chemical called PFOA that stops the popped kernels from sticking to the bag. This chemical can cause health problems, so it should be avoided. Pop kernels with an air popper or on the stove. Potatoes get a double dose of chemicals: on the vines and in the ground. The soil is treated with a fungicide to prevent blight. There's no way to prevent blight organically, which raises the price of organic potatoes. Nearly all types of peppers absorb a lot of pesticides through their skins. They are also sprayed with insecticides to prevent an insect infestation. You can't wash off the chemicals, unfortunately. Bugs love leafy greens like lettuce and spinach, so farmers use a lot of insecticides. These soak in to the vegetables and can't be washed out. Apples are sprayed with insecticides and other chemicals to keep critters away from them while they are growing. Farmers also use chemicals to help the fruit last longer. These chemicals are absorbed in to the skin and the flesh, so you can't wash it off. Celery absorbs a lot of water from the ground, and that means it soaks up a lot of chemicals. This is one food you should definitely look for in an organic variety. In my own non-scientific experience with organic food over the last year, I have noticed a difference in our family. We've been sick a lot less this year. And the food just tastes better! Most of our organic food comes from our farm. I froze and canned a lot of food, so we have healthy food all year.